Using the already extended cut of the film that comes on the retail DVD, I decided to re-insert the four deleted scenes back into the film. - after the actress is killed in the rain, ed wakes up to the sound of a scream, he goes outside to investigate and immediately finds the trail to the body, i didn’t like this so the deleted scene adds more of ed investigating the noise and checking in on the other motel guests before he finds the clues, more realistic in my mind. - this is a very minor addition, it basically alters a scene where the mental guy is being questioned by some guys, we see ed strapped to a chair, he is shown a mirror where he sees his real reflection, the original shows ed freaking out in the chair, the deleted scene cuts this and shows the guys real face and him freaking out. it feels a little strange to brand an extended movie as a fanedit (intro, credits, etc.) but i’ll bite. all of these deleted scenes are great and why they aren’t included in the movie proper is beyond me. unfortunately, the DVD is not well mastered. there seems to be a fluttering image (top of image is constantly changing pixel height) and the quality is sub-par for a full DVD. 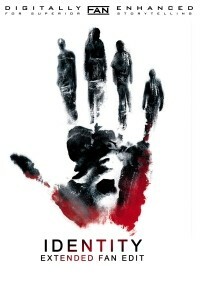 I enjoyed the movie Identity but felt some parts were rushed as well as the overall movie experience, this edit changed that for me. I enjoyed the extra scenes and in the end it did feel like a more well-rounded film. Also on a side note the cover designed for this is much better than the actual DVD cover itself (who the hell decided on that one?!). Good job Dluppers.